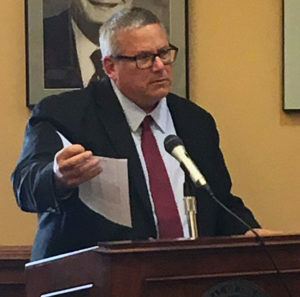 Iowa’s secretary of agriculture is touting a water quality plan House Republicans advanced earlier this year. Bill Northey says the plan would dedicate “significant” state resources to address water quality concerns. “A real committment, no new taxes…is a great pattern to work from and we’d certainly be very supportive of that,” Northey says. This past January, Republican Governor Terry Branstad proposed diverting some sales tax money levied for school infrastructure projects to water quality initiatives. House Republicans came up with their own plan, using water usage fees and gambling taxes for water quality projects. Neither idea was debated in the Senate, where Democrats controlled the debate agenda. “We recognize that there’ll be good conversations this year at the legislature this year about water quality funding,” Northey says. Northey, a farmer from Spirit Lake, has been Iowa’s secretary of agriculture since 2007. Northey says farmers in Iowa have been “very active” in trying to control and reduce farm chemical run-off from cropland. Critics say the voluntary approach isn’t working and it’s time for the federal government or the courts to force changes in farming practices.